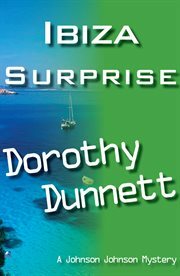 The item Ibiza surprise, Dorothy Dunnett, (electronic resource) represents a specific, individual, material embodiment of a distinct intellectual or artistic creation found in Austin Public Library. Life in Ibiza can be glorious and fast, especially for those who have money. Sarah Cassells is an intelligent girl and has many admirers. Having completed her training as a chef, she hears of her father's violent death on the island, and refuses to believe it when told it was suicide. She becomes involved with a series of people who might be able to shed some light on events, including her brother who is an engineer for a Dutch firm from whom a secret piece of machinery has been stolen. As Ibiza prepares to celebrate an annual religious festival events become more convoluted and macabre. Sarah has choices to make; none are simple, but fortunately Johnson Johnson, the enigmatic portrait painter and master of mystery sails in on his yacht 'Dolly'. Together they may get at the truth, but with murder, espionage and theft all entwined within the tale, there are constant surprises for the reader - and for Sarah!